The Rockinfreakapotamus magazines are bigger than my scanner and I’ve been battling with them to try and get them online for ages now- new technique! Have photographed the pages so they can be seen in their entirety and then scanned pages/sections for close ups where relevant (lots of pages are contacts by fan club members e.g. photos and swapping addresses for ‘pen friends’ for those of us old enough to remember that system involving letters and stamps in the world before social media!). The six magazines I have managed to obtain are all listed here. If anyone can help out with the issues I’m missing (either to scan, photograph or sell), I’m really interested as I’d love to get them all online in recognition of the hard work that Blackie Dammett put into the fan club. Some photographs of Rockinfreakapotamus magazine covers. Thank you very much to R!ch~Plenge and Melanie Owens who have scanned and photographed some of their Rockinfreakapotamus memorabilia for us! We really appreciate them sharing. I’ll have to check, but I had received a letter years ago, telling me something about being the first people in the fan club, and as a result got some special sticker and some other stuff if I remember right. I should have a cassette also of the band talking about the club. And I have a rockinfreakapotamus varsity jacket…….man that was 20 some years ago. 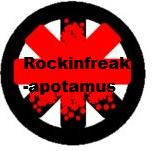 I was a member of rockinfreakapotamus! I just found my embroidered patch! And sticker showing my name and member number. I was an early member of the club. I have the 1st newsletters in great condition, Volume 1, issues 1 through 4. Looking for any info on the other issues. Do you have a scanner or could photograph the pages?!!! I’m desperate to build up a collection of all of them on here. Even contacted Blackie but all of his spares were lost in a house move along the way. This is the original Red Hot Chili Peppers Fan Club Kit as sent out in 1990. I also have a “backstage pass” (not-pictured) that came with the kit that I have not included because it has my name on it. I’ll throw it in though if you really want it, let me know after you have won the bid. Sorry we are just fans too.